This article briefly introduces techniques and devices for computer network analyses (incl. wireless networks). The greater part of this article and its structure are based on the seminar which took part in Prague on April 3rd 2006, attended by representatives from various companies and organizations. The following text is neither an advertisement, nor a recommendation to buy Fluke Networks products. According to our opinion, introduction of these devices can be the first step in considering buying these or similar tools and can help with placing requirements on network diagnostics. Part 1 - Solving physical layer problems, bandwidth verification. PC connectivity problems, testing and debugging VoIP. Even a short network failure, no matter if in a small or large company, is uncomfortable or even dangerous. Large companies require maximum availability, so even a short failure lasting for a few seconds or minutes can be critical. Professional network technicians cannot do without special tools for network analyses, monitoring and optimization. Initial costs usually return very quickly. Saved time and valuable information have great benefits. It does not have to be a matter of hours to find the source of problems, but just several minutes. Up-to-date devices and SW tools provide many advanced features. Long-term automatic monitoring provides warnings, automatic remedy or failure prevention. Today, it is required that we look at networking as a science. There are 3 main parts of the networking process: 1. Planning, realization and documentation. 2. Prevention and prompt problem detection - especially thanks to monitoring and the overview of what is happening on the network. 3. Following the procedures for problem solving - a.) collecting information about the problem, b.) localizing and isolating the problem. c.) problem resolution, d.) event documentation. 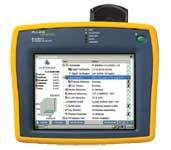 Certification Tools - are used to measure installed cabling. The resulting parameters are compared according to certification standards. The results from these measurements are available to the cabling manufacturer who grants its warranties, as well as to the customer as a certification of fulfilling the requirements given by standards and documents of the certification. It is usually tested whether the cables meet international standards of Cat5, Cat6 or Cat7 categories (the standards ISO/IEC 11801, EN 50173, TIA/EIA 568-B provide more detailed information). Qualification Tools - tests the speed which can be transmitted through the cable (if it corresponds with the bandwidth, e.g. 10000BASE-T, 100BASE-TX, 10BASE-T). Verification Tools - perform basic cabling test: if the cable is working, if all pairs are connected correctly or if there is a crossover cable. A certification tool for cabling certification in various categories and groups. The tool is equipped with adapters for optical and metallic cabling. Accuracy: 4 levels / 6s autotest, cat6. Battery life: 12 hours. Bandwidth: up to 900 Mhz. It displays problematic connectors or cables and suggests corrective actions. All devices are supplied with free SW LinkWare for replaying, displaying and processing the test results on a PC. Users can also update the firmware and adapt to new cabling conditions, e.g. cat7 testing. There exist several models. They differ in frequency, diagnostics speed and accessories. Detects problems with the network and bandwidth. Qualification tests. Provides powerful diagnostics. Bandwidth qualification - users just choose tests they need and push the appropriate buttons. Results will be displayed, whether cabling passed the test or not. If not, users can use a specified button to view details, e.g. a problem with connectivity on a particular pair. Easy verification of cable performance. Displaying of wire connections and their lengths. Verifies the quality of connectors and also displays crossover joints. Displays incorrectly connected connectors, cable breach, the total length of a cable and particular pairs. Tests coaxial cabling - designed for antenna cabling. Performs Multi-Map - testing of several plugs at the same time using terminators (each terminator has its name - ID 1 - 7). Easy to find where the cable is leading to. NetTool combines cable, network and PC configuration testing into one small device so you will have everything you need to quickly resolve even the toughest connectivity problem. Fast cable testing and information about both devices - speed and duplex (no notebook needed). 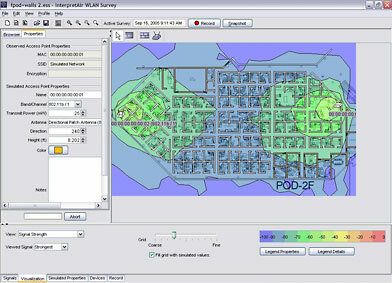 InterpretAir = Software for planning, documentation, analyzing, simulation and optimization of wireless networks (Wi-Fi : 802.11 a/b/g). Analyzers for ISO level 1. to 7. Comprehensive network overview. analyzes the load of particular applications and devices, detects the type of application and traffic, easy detection of devices that cause unusual or higher load on the network. Transaction Time – enables to determine the exact response time and replaces the users' view on the performance - whether it is acceptable or not. Server Response Time – tests availability and compares performance and effectiveness of the server (time between data request and the first response from the server). Network Round Trip Time – measures time needed for the packet to go through the network. Enables to compare the level of services for particular data lines. 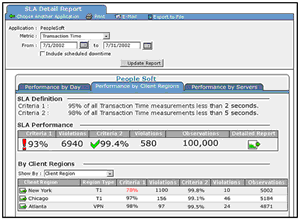 Server & Application Availability – Measures server and application availability. 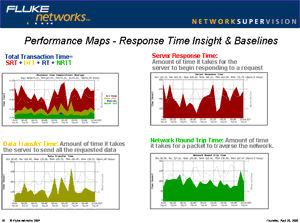 Usage example: SuperAgent detects server slowdown - SNMP requirements for information about CPU load and memory are executed, and the performance and memory processes of the processor are displayed. ReporterAnalyzer is a powerful analysis engine utilizing Cisco IOS® Netflow data and presenting them in brief reports according to your requirements. Cisco IOS® Netflow - Software technology contained within the Cisco IOS that provides monitoring of data flows in WAN networks and collection of statistics. A Netflow record (datagram) contains information on packets, such as: Source IP address, Destination IP address, Source Port number (TCP/UDP), Destination Port number (TCP/UDP), Layer 3 Protocol Type (IP/ICMP), Type of Service (ToS), and Input logical interface; any variation in these criteria distinguishes one flow from another. Routers and intelli-switches with a Netflow support can export the data flow reports to a database for further processing. Those exports are called NetFlow Data Exports (NDE) and they are regularly sent to an administrator PC or a netflow collector / harvester through a UDP protocol (no special protocol is needed). To process the information, you can use either an SW by CISCO or by a third-party manufacturer. Powerful HW and a part of the line capacity may be needed for large data flows. Network Monitoring—Netflow data enables extensive, real-time network monitoring. Techniques based on flows analysis are used for displaying the traffic related to particular switches and routers. Appropriate tools provide information about the entire network, as well as professional problem detection and solution. Application Monitoring and Profiling —Netflow data enables to gain a detailed view of time response in applications on the network. This is important when new services are being introduced and when network and application resources are allocated. Wide range of options for utilization in planning networks and designing HW and SW solutions. User Monitoring and Profiling — designed for network engineers. Netflow data helps to understand utilization of network and application resources. This information is used for optimal utilization of access to backbone, application resources and for detection and solutions of potential security and policy violations. Network infrastructure Planning—When long-period analyses is being executed, it is possible to anticipate network load growth and plan upgrades to increase the number of routers and requirements on capacity of the internet connection. NetFlow optimizes network planning including peer-to-peer communication, backbone upgrades, routing and security planning. Network optimization helps to minimize total cost of network operations, while retaining optimal performance, capacity, and reliability. Netflow detects unwanted traffic on WAN network, validates needed bandwidth, quality of service (QOS) and analyzes new network applications. When optimization is needed, you have more options thanks to precise information: 1. Optimize network so that no expensive changes are needed. 2. Find out the effects of changes (easy costs appraisal). Thanks to detailed information, you can find the weak points, such as particular devices, hosts or problematic applications. Using optimization you can avoid high costs for line or HW upgrades. Security Analysis — An important feature of NetFlow is an identification and warning of unwanted activity on the network, such as DDOS attacks, viruses, worms and port scanning in real time. Changes in network operation indicate anomalies that are clearly and immediately demonstrated in NetFlow data. The data can also be a valuable tool to understand and replay the history of security incidents. Accounting/Billing — Statistic data provide the most precise information for traffic measurement. Apart from the bytes and packets, they provide detailed information on IP addresses, time, type of services and ports. Service providers utilize this information for billing based on time of the day, bandwidth usage, quality of service etc. Customers may utilize information for cost allocation for network resources utilization. NetFlow Data Warehousing and Data Mining —Net flow data or derived information can be later used for analyses in support of marketing and customer service programs. It is easy to figure out which applications and services are being utilized by internal or external users, and then use them for advertisement purposes and service improvements. Moreover, they provide important information for market research related to businesses and service providers: who, what, with whom, how long and at what time communicated.